I was answering a question on yesterday's post about sand play when I had a brainstorm. (Ok, maybe it was more of a sprinkle than a storm, but still...) It occurred to me that we, the golfing public, may have a misunderstanding. I think we need to rethink our concept of bounce in sand play. Yes, I said concept. Mention "bounce" to most players and they think of a huge lump of metal on the sole of a sand iron. Yes, that heavy sole is called the bounce of the club... but if that's all you think bounce is, then you're missing the whole point. With only that simple understanding, you can make the mistake of thinking that you need a club with a big heavy sole to play well in sand. But if that's true, then how did Seve Ballesteros manage to play sand shots with a 3-iron? Clearly there's more to this whole bounce thing than just equipment. You need to understand that EVERY club in your bag has bounce. On a sand wedge the bounce is positive (that is, it sticks down lower than the front edge of the club head) while a wood may have neutral or even negative bounce. You don't usually think about bounce when you play those clubs, but the bounce controls how high you can hit the ball. We'll limit our discussion to irons since those are the clubs whose bounce concerns us most. The purpose of bounce is to keep the front edge from digging in. Period. 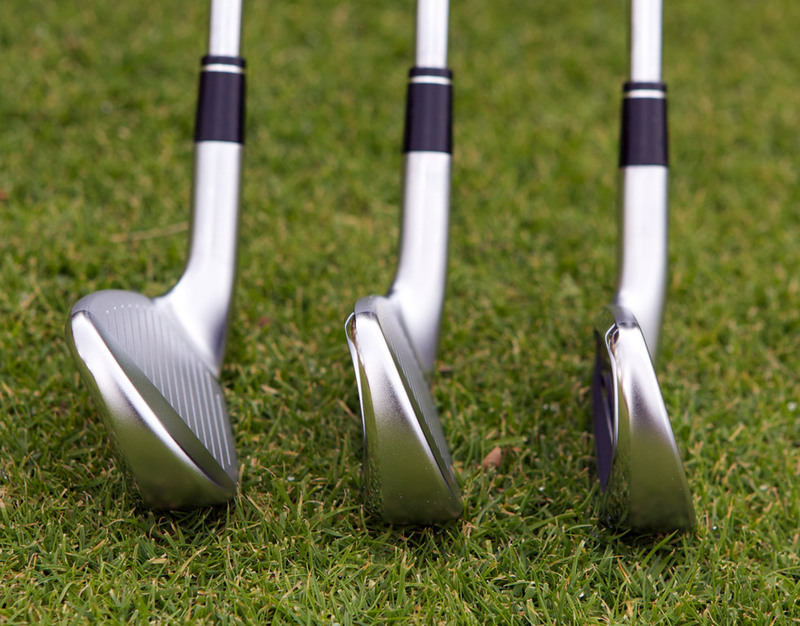 A heavier sole makes it a bit easier to control the how the club bounces; the less weight there is in the sole, the more critical a precise hit is. That's why Seve could play sand shots with a 3-iron when most players can't; Seve controlled how the club head entered the sand better than most. You "lay the club face open" and "cut across the target line" in order to further limit the front edge from digging in. Take one of your short irons and take a stance right there in your home, on a hard floor, with the shaft either straight up or leaning backward, and take a good look at the front edge. You'll probably see a little bit of space between the front edge and the floor. That's because the bounce is holding the edge off the ground. Can you see how the front edge will lift up off the ground if you tilt the club shaft backward so the face points up at the sky? And the shorter the iron, the more space you'll see. Now twist the club face open and check again. There's even more space between the front edge and the floor. That's because opening the club face points the face more toward the sky, so the bounce on the sole is holding the front edge of the club head up even higher. If you were actually swinging this club through sand like this, the bottom of the sole -- that is, the part of the sole that connects directly to the front edge -- would also act like a little bulldozer blade to the head from digging in so much. When Seve used a 3-iron, he further tilted the face up by squatting down and lowering the handle of the club closer to the ground. In effect, he created a flatter swing plane to the club head entered the sand even less steeply. I think you'll find that your sand play improves considerably if you start thinking of the physical bounce of any club head as the back of the club head rather than just the sole. To get the back of the club head down onto the sand, you have to point the face of said club up at the sky. That's part of what the "L-to-L" swing taught in yesterday's post helps you accomplish. You want to get that club face pointed up at the sky as it reaches the ball and enters the sand. It will take a little mental adjustment. At first you'll try too hard. But as a general rule, if you can get the club shaft fairly vertical as it hits the sand, with the face open, and making that "L-to-L" swing, you're going to find that your sand play improves dramatically. And one other tip: I would suggest that you start by practicing with a 9-iron. You'll have to lay the club open and lean the shaft back to get the club face pointing up. Since it doesn't have a big heavy sole it forces you to think of the back of the club head as your "bounce." Initially it may be a bit frustrating, but you'll make progress more rapidly because it forces you to swing properly. That's how I finally learned to play sand shots successfully. and I have good result with it. Thanks for the link, Peter!